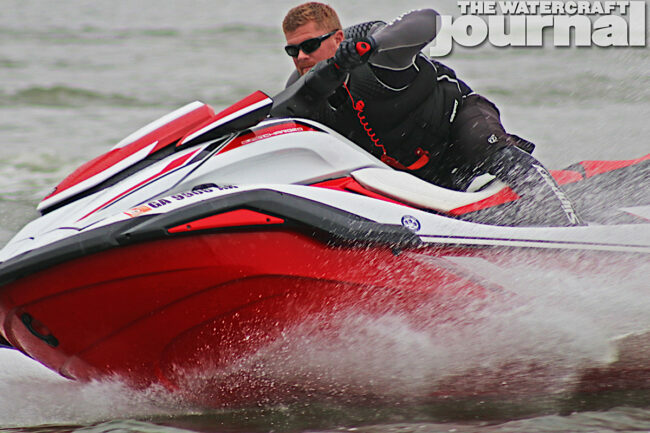 Backwater Barnstormer: 2019 Yamaha FX SVHO WaveRunner | The Watercraft Journal | the best resource for JetSki, WaveRunner, and SeaDoo enthusiasts and most popular Personal WaterCraft site in the world! It has become a bit of a litmus test for me in recent years. 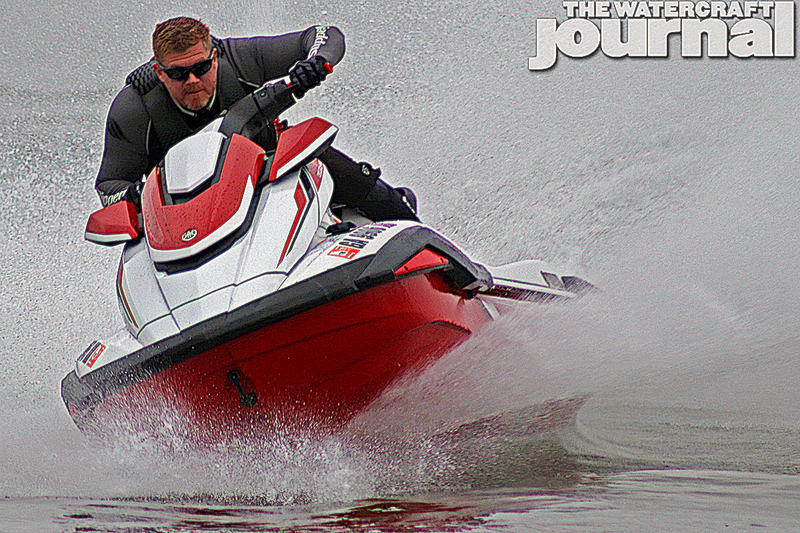 While incredibly unique in its topography, the narrow canals, serpentining routes through densely-packed cypress and mossy banks make the circuitous trails of Morgan City, Louisiana an exemplary test bed for new watercraft. 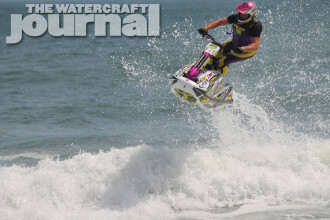 Radical swings in weather quickly churn larger bodies of water into brutish chop. A steady stream of recreational boaters, concrete barriers and continual barge traffic all require honed reflexes and a craft responsive to input. 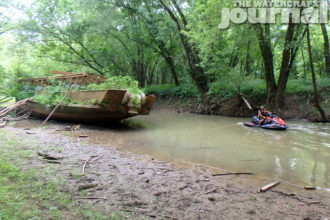 In attending the annual Mudbug event, I’ve wily used it also as a proving ground of sorts. Using what particle of celebrity my position here at The Watercraft Journal can muster, I’ve muscled in on several groups’ rides over the elongated weekend – always equipped with a new or current model machine for the precise reason mentioned. The more technical the route the better. In a good single day’s ride, evaluations on fuel consumption, ergonomic comfort, access to storage and features can be quickly gauged; in addition to assessing rough water tracking, rider response and handling. 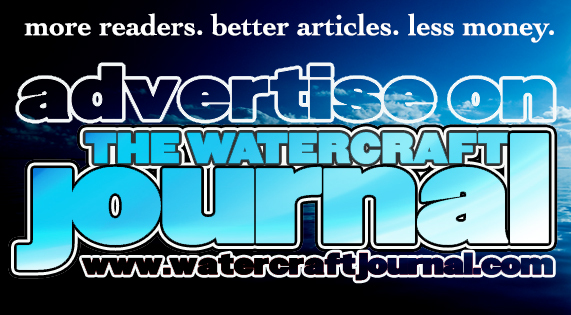 Truly, the backwaters of the Louisiana bayou have provided this magazine with chapters of data. 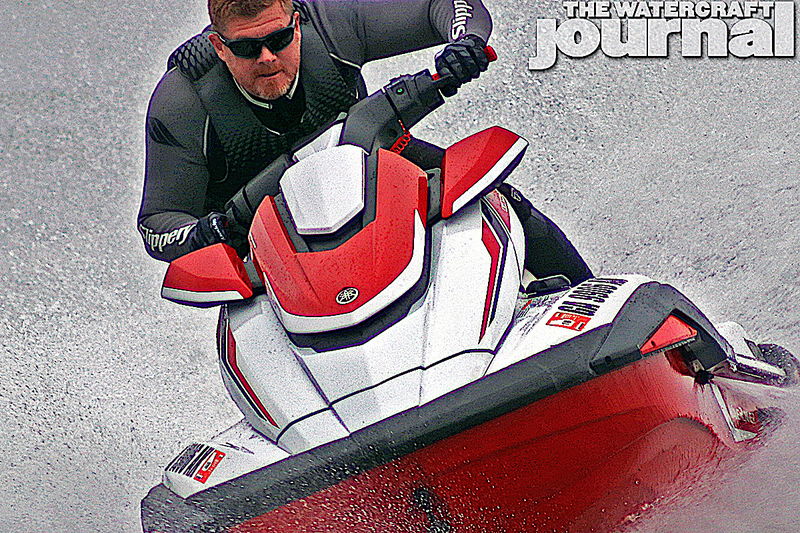 It was mid-September of 2018 when the Pure White and Torch Red Metallic 2019 Yamaha FX SVHO WaveRunner was loaded onto my well-used, dual-bunk PWC trailer. It was, as explained to me, the one and only of its kind, and needed to be returned in equal (or better) condition than I had received it. Days later, while racking up a few hours on the clock, I filmed a live walkaround of the new new FX SVHO for our Facebook followers. 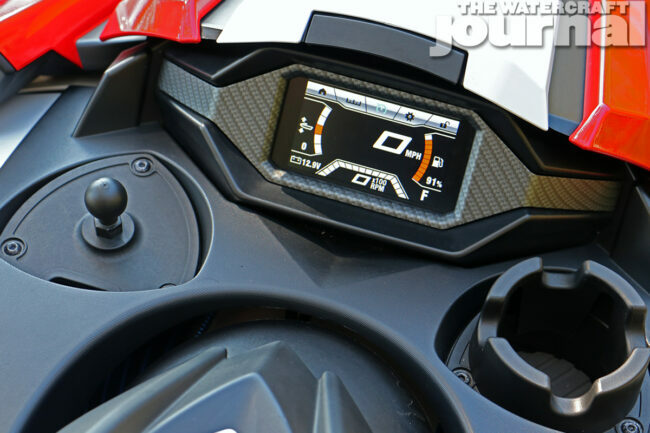 Questions pertaining to the new footwell drains, RAM multi-mounts and of course, the Yamaha ConNext full-color digital dash poured in. More videos soon followed. Yet, the real testing didn’t begin until weeks later in Morgan City. The Fall Mudbug fell on the same weekend as the IJSBA World Finals; and frankly, a weekend spent riding a brand-new SVHO-powered FX wide-open with friends sounded far more appealing than the other option. Temperatures cooled somewhat since June’s mid-summer Mudbug, and while attendance was lessened, the riding schedule was robust. 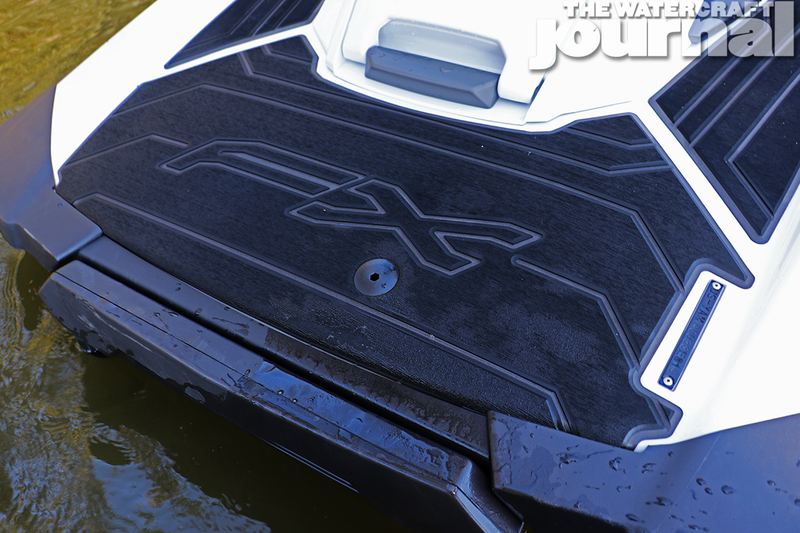 Hundreds of miles through the St. Mary Parish swamps passed beneath the FX’s redesigned hull and through its 160mm 8-vein pump. Changes made to the FX platform can nearly be measured in similarities shared with the current GP1800R. Yamaha views its lightweight, podium-dominating GP1800R as a bit of a magnum opus these days; seeing to apply much of the design techniques learned here and used on the FX. For 2019, the footwells are wider, sloping and flanked by shallow gunnels. 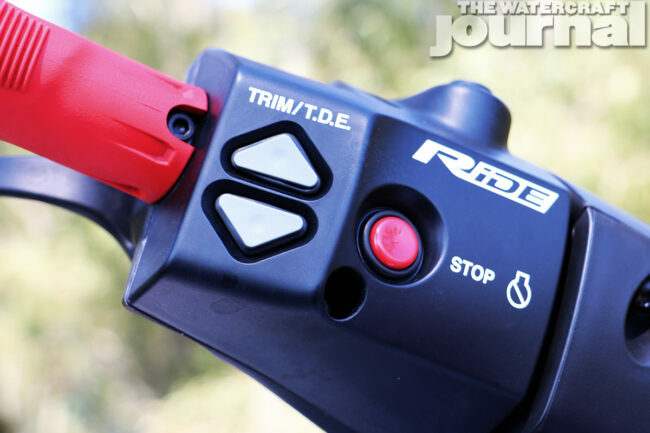 This permits the more aggressive rider greater ease to reposition their footing when entering into a tight hairpin as well as comfortably moving around the saddle when sitting stationary. 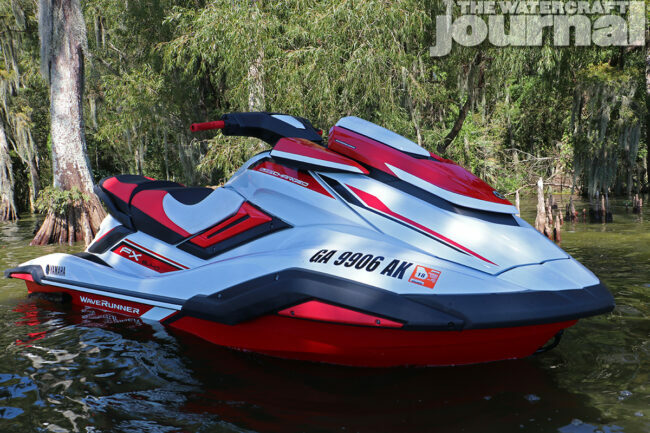 Aesthetically, the FX’s design is an evolution of the previous model; smoothing the edges and rounding the contours, giving the full-sized 3-seater a swooping, fluid flowline. 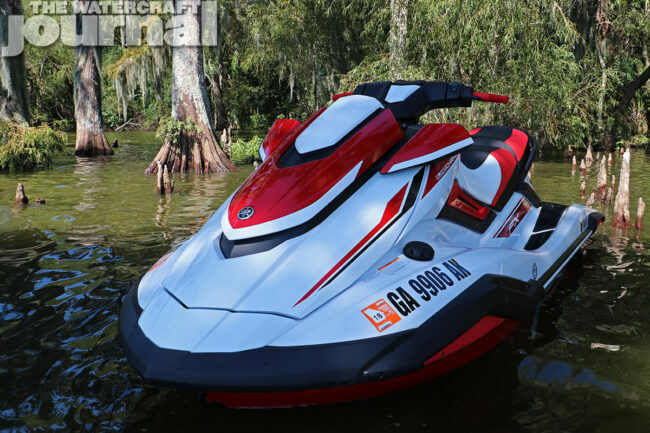 Dimensionally, the new machine is ever so slightly larger: 140.9-inches long (140.4-inches), 48.4-inches tall (48-inches); 50-inches wide (48-inches); yet impressively, 15-pounds lighter than its predecessor (818-pounds vs. 833-pounds). And all accomplished while increasing total storage an impressive 11-gallons (44-gal. vs. 33.2-gal.) with most of the gain found in a widened and deepened bow locker. Although standard equipment for the fully-loaded FX Limited SVHO, a soft-sided cooler was designed specifically for the deep recess in the bow. We found our rigid Igloo and camera bag also fit snugly there as well. 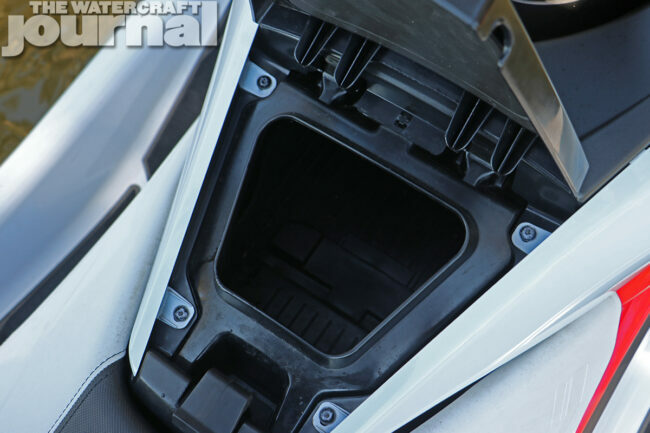 Yamaha also radically redesigned its glove box. The result is a easy-to-access, padded and rubber-lined bin nearly a foot deep with a wide entry allowing us to store our full-sized DLSR and other equipment without fear – because it’s also the first watertight glove box in the industry. 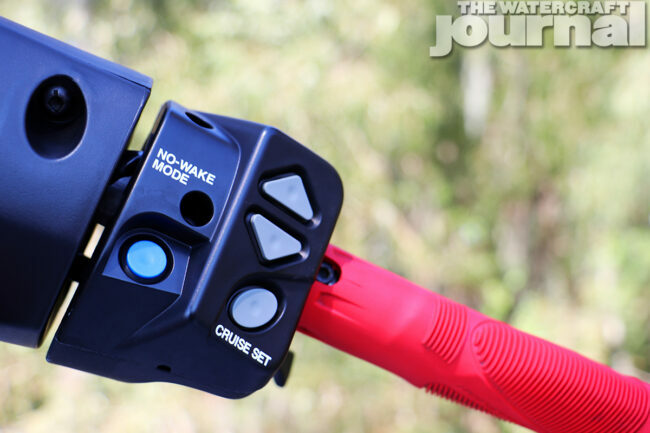 The soft rubber latch requires some acclimating, but is serviceable once you’ve familiarized yourself with it. 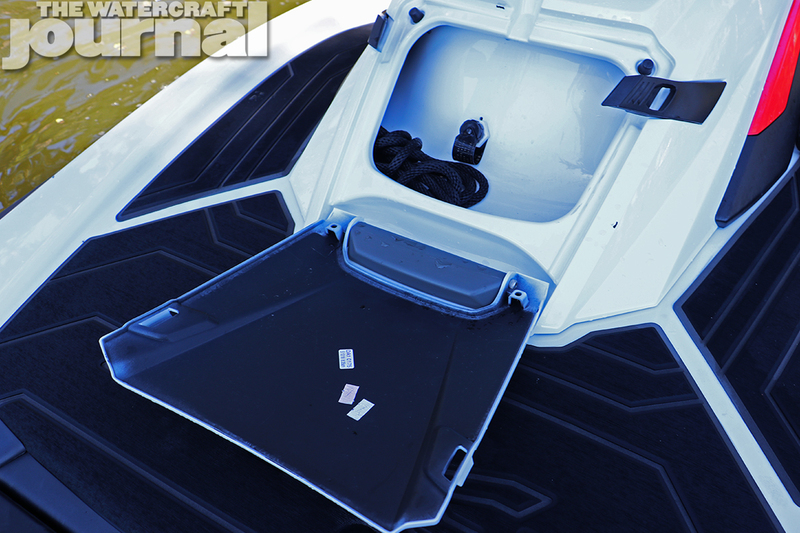 Of course, as is with all FX’s, a gasketed watertight screw-top storage pail is fixed beneath the rear passenger; and a dual-latched “wet storage” cubby for a tow rope or other items, is found on the stern as well. Ergonomically, the new cockpit (or “cabin” as some marketing materials write) feels low-slung and reclined somewhat. The three-tone cut-and-sew seat is moderately bolstered, with attention given towards pinching inward at the knees. The elongated neck sets the steering controls further back, particularly when adjusting the 5-way tilt steering to its lowest setting. Throttle triggers (including RiDE with Traction Control) as well as controls for electric trim, Cruise Assist, No Wake Mode are all within reach, including Yamaha’s new “zero crank” automatic Start button. Fore of the steering neck are the two ports for the RAM multi-mount system. For the FX SVHO, a single RAM mount puck is provided, paired with a (gratefully deeper) beverage holder. 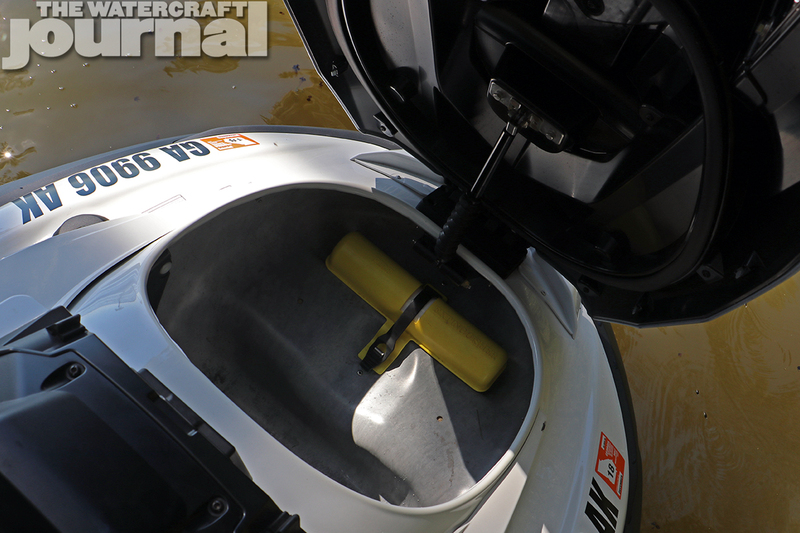 The cup holder can be removed (with the use of a hexed wrench) and upgraded with another RAM base plate, or traded to the other side. 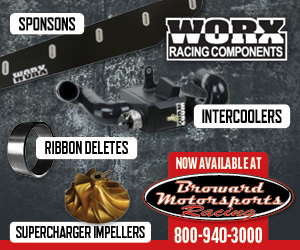 The two are identical and can be customized to fit your needs. 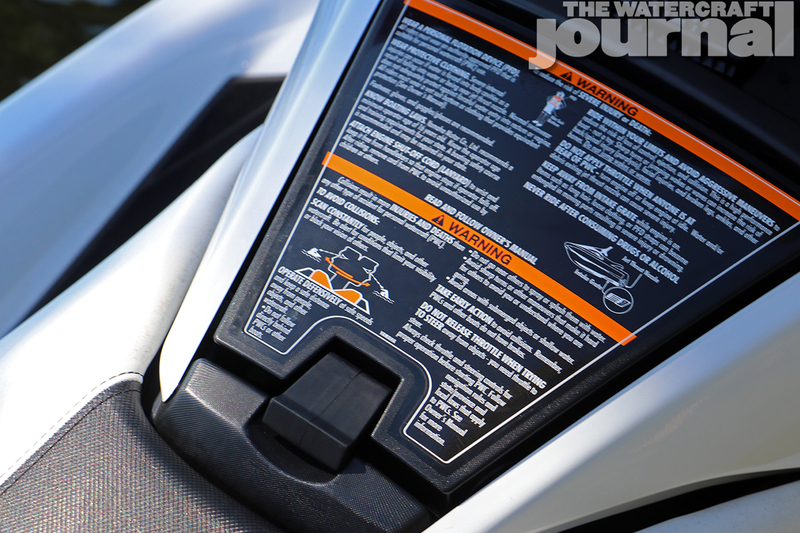 For most of our time with the 2019 WaveRunner, we kept our Garmin GPSmap76CS on hand, tracking our speed, mileage and so forth. And yes, in Louisiana’s cool morning air, we clicked off a sustained top speed of 68.6 miles per hour (and that was with a 235-pound rider and 64-pound passenger). Of course, the major addition to all FX machines is the addition of the industry’s first full-color, digital touchscreen dashboard. 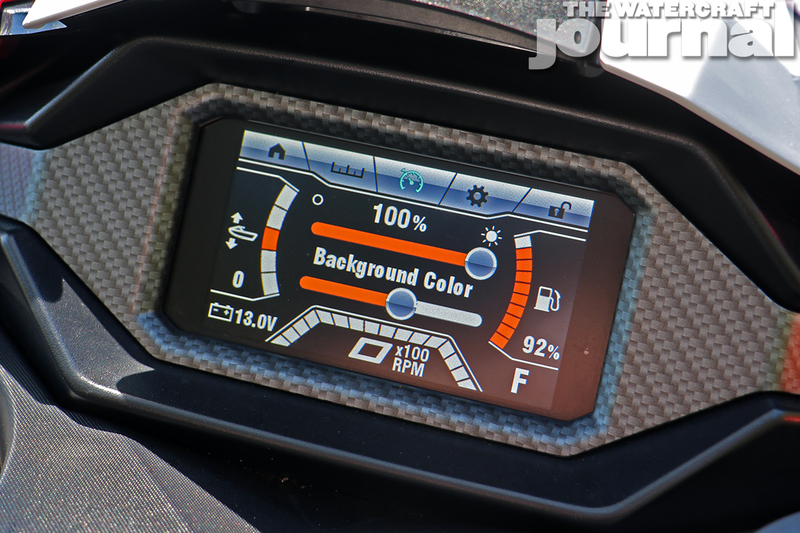 Operating Yamaha’s ConNext software, operators can toggle through a series of prompts to customize their display colors, input a unique PIN number (thus eliminating the security key fob), as well as observe fuel consumption rates, estimated miles until empty, and engine service alerts. 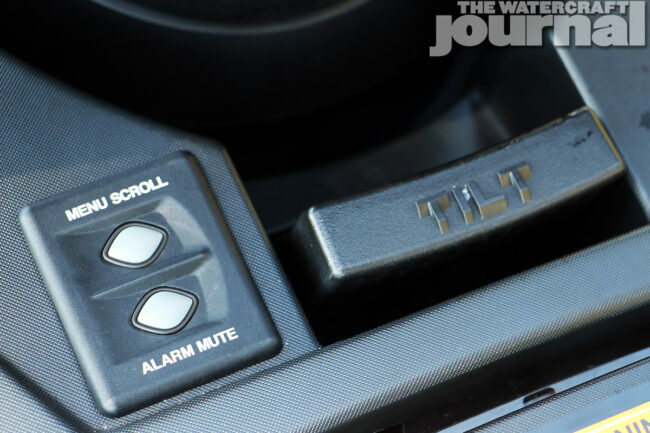 A key feature is the Drive Control feature, allowing the PIN holder to preset maximum speeds and acceleration curves, ideal for new, novice or less-than-trustworthy operators. Beneath the two-piece saddle rests Yamaha’s Super Vortex High Output centrifugally-supercharged 1,812cc 4-stroke marine engine. 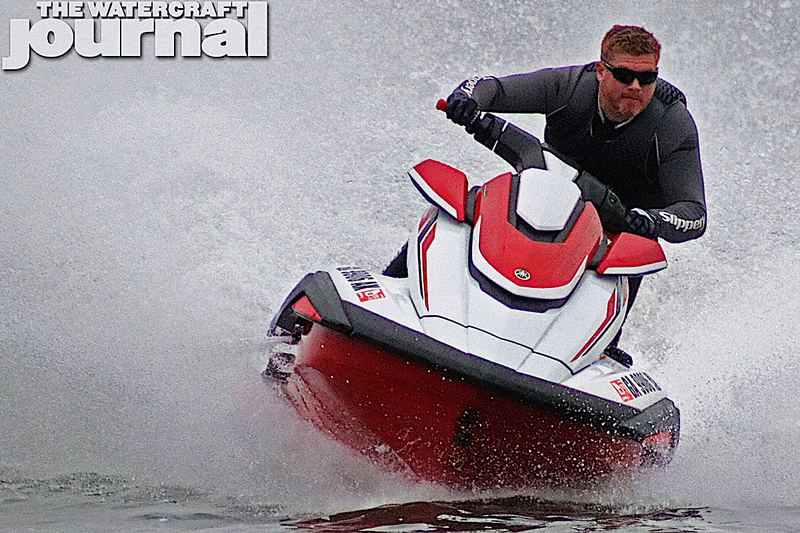 The four-cylinder SVHO has been a mainstay of the brand’s top performing WaveRunner lineup since 2014, and has only seen minor changes and material upgrades since its introduction. At 1.8L, it continues as the industry’s largest-displacement 4-stroke available, delivering plenty of low-end grunt to launch the FX SVHO out of the gate, until the boost kicks in rocketing the WaveRunner toward its aforementioned top speed. 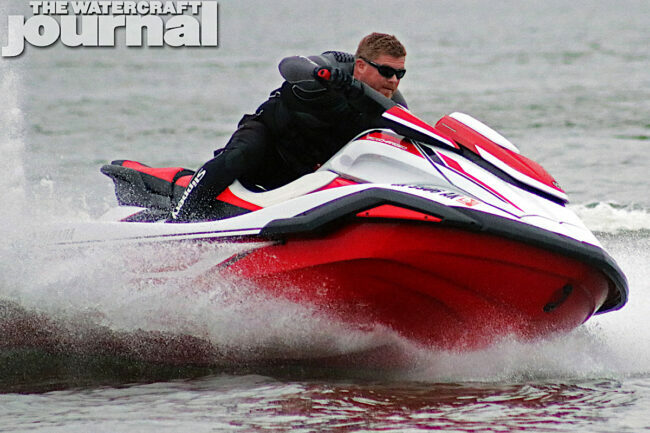 Unlike the progressively stepped-V hull of the outgoing FX, the current model borrows heavily from the unbeatable GP1800R. 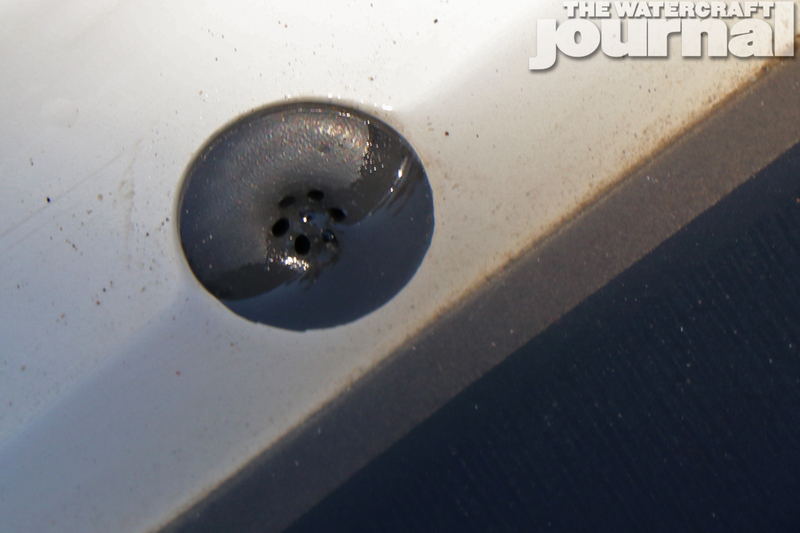 Bellow the pointed splash-guard chine, resides the signature “anchor head” dual coved hull design of the GP. 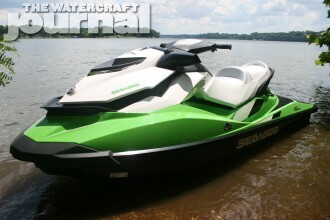 The rounded chines split and divert the water into twin wakes as long lifting strakes run nearly the length of the ski. These give the ski enough lift to ride on the keel without requiring an exaggerated deep-V, which often creates significant drag. When not at a rapid clip, the FX floats on the split cushions produced by this anchor head-design, providing a comfortable, easy ride. Yet, when wrung out, the FX’s comes to life in a ferocious way. 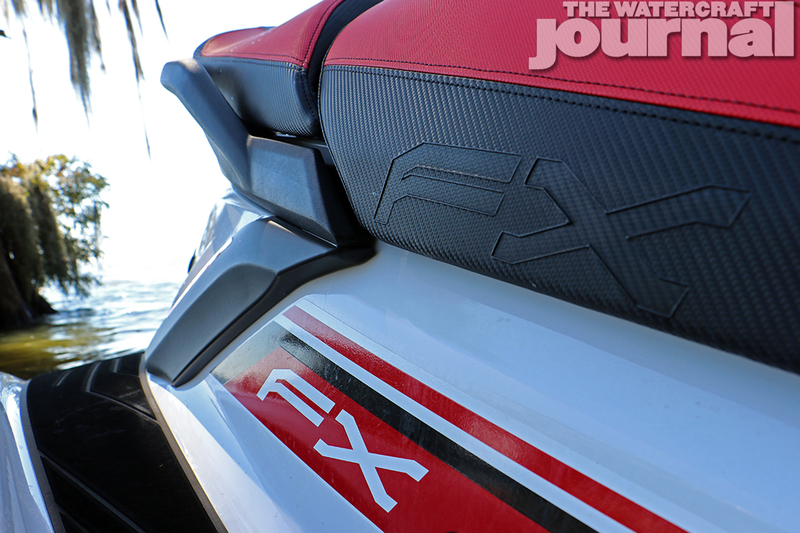 Featuring the most intuitive inside lean of any full-sized runabout available today, the FX SVHO rolls inward, reeling naturally like a sport bike, encouraging the rider to vise the throttle further open. Steering input at these speeds is instantaneous – almost precognitive – and entirely predictable. The WaveRunner rides instinctively forward on its haunches, requiring little added downward trim to really bite into the corners. Coaxing the runabout through the tight twisties of the bayou can appear a bit raucous in the video below but to the pilot, it feels as natural as a water skier threading the buoys. 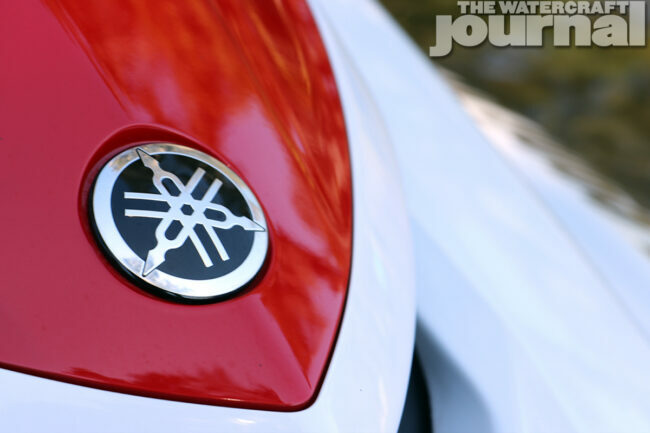 A weird quirk for the redesigned FX SVHO was an issue with excessive fuel spillage at the pump. 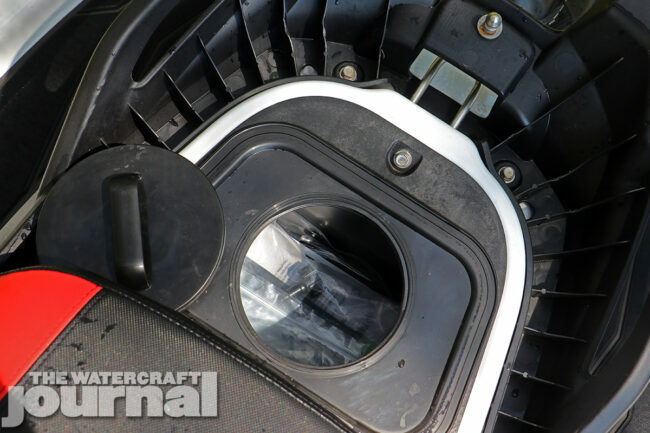 For 2019, the filler neck was relocated from high up on the deck (tucked beneath the front cargo hatch) to outside, on the left-side fender. 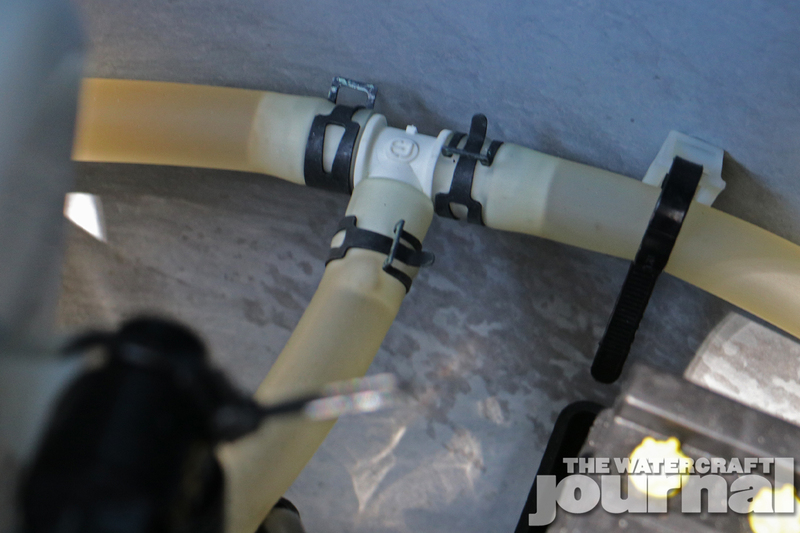 The low sloping, nearly-horizontal angle of the filler tube tends not to evacuate air as rapidly as the previous high-mounted filler, causing the neck to burp up fuel when pumping at too quick of a rate. I learned to slowly fill the tank with the pump nozzle held up over the filler neck to let air escape. 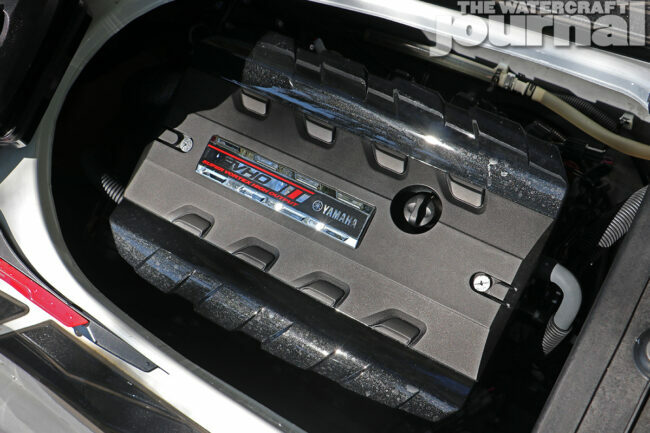 Admittedly, this review comes a little late as gains have already been made by RIVA Racing and other professional tuners, pushing the new FX SVHO to speeds in excess of 84 miles per hour. 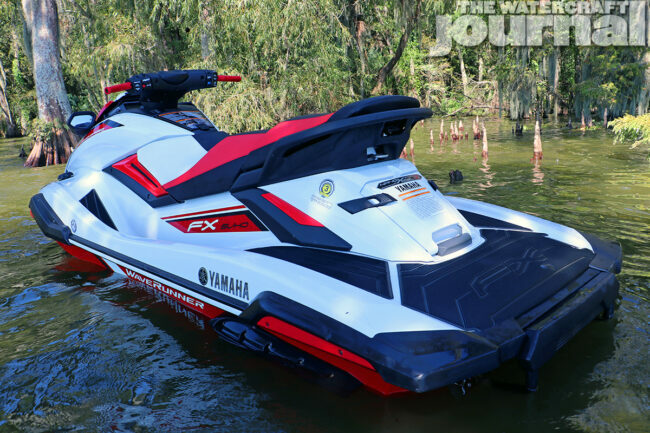 The potential within the 2019 Yamaha FX SVHO WaveRunner is akin to the unlockable speeds extracted by performance enthusiasts from the GP1800R. Priced at $15,499, the major takeaway from Yamaha’s redesigned FX SVHO is a sportier, more nimble and far more responsive full-sized runabout than ever before. 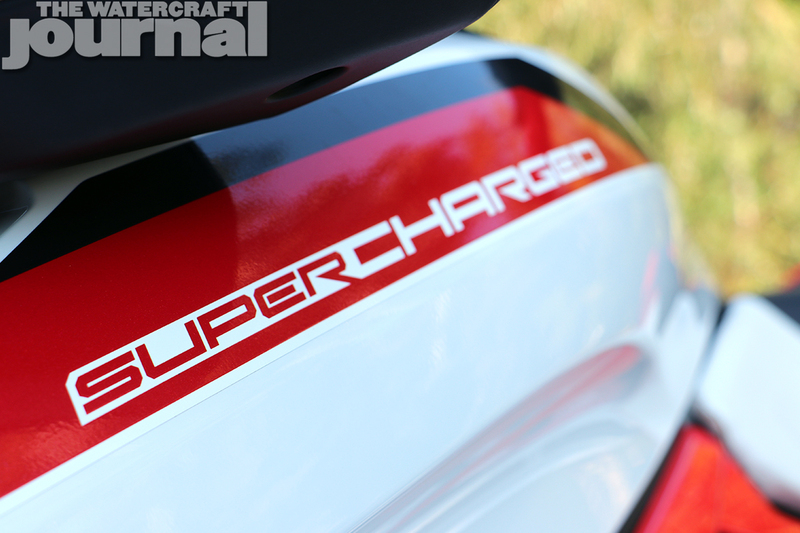 And that is something that will please all of those looking for a top tier 3-seater that can also serve double duty as a riotous, fun-loving performer.